The Power of Healthy Eating is quite an interesting personal touch cookbook written by a Personal Trainer and small business owner in Annapolis, MD. She has such a Love for not just helping others be Physically fit and active but to learn how to eat well in order to "see" the Results and Feel their Best. In addition, most of the recipes are simple, quick and full of flavor and nutritionally balanced. What makes this Cook book a bit different than any other is that Teresa has had 15 years in experimenting in using high quality Protein Powder in some of her Recipes and has a nice selection of recipes using Beverly Brand which is what she chooses in her cooking because it is one of the Cleanest purest forms of Whey Protein. For those who Work out regularly, you will enjoy this chapter. The Power of Healthy Eating is just the beginning as the second book will be out summer 2011. Many Gluten Free & Vegetarian choices ahead. 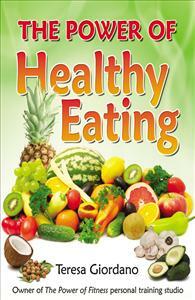 This is an excellent book to help people who want to eat healthy but don't have alot of time to prepare meals. I look forward to the next cookbook for additional recipes! I've tried almost every recipe in this book!! For being healthy, everything has a great flavor. Its nice to see new ways to eat things I didn't think I'd like. I highly recommend the Chicken Pot Pie, and the Mexican Chicken Dish...YUMMY..they're my favorite!!! I am a busy mom who does not like to feed her kids fast foot, and this cookbook allows me to create tasty food that they enjoy and they are good for them. A lot of these recipes can be frozen, like the high fiber breakfast cookie. My whole family loves the Banana Coconut Mini Chocolate Chip Cupcake recipe. It is nice to have a healthier choice for a dessert. The Mexican Dish was super easy and a big hit with my teenage daughter! I have tried many of the recipes in this book now, and am thrilled with ease and tastiness of the foods. Famous Chicken Salad is the best Ive ever had, the Turkey Chili is out of this world, Power of Fitness Quiche is awesome, Chicken Soup is to die for, Banana Coconut Mini Chocolate Chip Cupcakes are soooo tasty. 6 weeks of clean eating and exercise have transformed my body and my mind! Cant wait for the next edition!